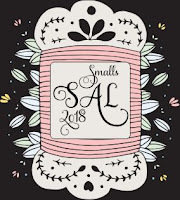 This is my 61st entry for the Smalls SAL (known as the Ornament SAL in Year 1) which means I have taken part every month for 5 whole years! Now starting the 6th year. That's a whole lot of Smalls! Frankly I think I deserve a prize for that. Haha, my name got chosen to win last year's prize! Thank you, random number generator. This year I will be showing the block I stitch for the Christmas Ornie SAL and any other smalls I may complete during the month. I am continuing with both my 10-a-Day (don't snigger, Christine) and my 30-a-Day challenges so there should be at least one Small each month. And maybe even some fully finishing! The next one in line is Painted Lady. I have made a change to the colours on this one. I am using 3041 and 3042 purples instead of 611 and 612 browns. I started the 611 and it just did not look right on the white fabric. The original was stitched on dark green fabric. Seems like the Smalls SAL should be renamed the Just Nan SAL for me this year! There is still plenty of time to sign up for the next Blog Hop. I need the photos for the Secret Stitching Sweetheart by the 10th February. So if you want to take part, leave a comment or send me an email and I will add you to the list. Finally, for those of you not getting notifications for comments left by no-reply bloggers - check your spam folder. I routinely check mine and found 60 email notifications hidden in there. Some from Nigerian Princes and Russian Ladies wanting to marry me but mostly from no-reply bloggers. Seems like Gmail had decided you were all spam. Beautiful stitching and lovely projects as usual. I do like the Just Nan Day 1 of 12 Days. I'll be watcbing for each one as the months pass by this year. I love statistics ...congrats on winning the Smalls SAL prize.I think projects like 12 days of xmas or flower of the month are perfect for this SAL. You are very loyal to Just Nan. Great stitching as always! Love watching your 10 a Day and 30 a Day projects grow. Congratulations on a full 5 years. That's amazing. Your projects are beautiful. congrats on 5 years worth of smalls, that's very impressive. Pretty JN's you've chosen this time round. Jo: Congratulations on the win. Congrats on your win. You're right you sure did deserve it for all those entries. I just love all your beautiful Just Nan's. Congratulations! Very pretty Smalls to show this month! Oh what lovely finishes! I'm looking forward to seeing the rainbow one with its charm. The colours are very different from all the Just Nans I've seen so far. Haha, yes, for you it's the Just Nan SAL.